From spiral designs to Rococo style works of art; staircases are major architectural features that have the power to showcase personal style, inject character and make an ordinary space spectacular. Nowadays architects and designers pay a lot of attention to detail, transforming the once-functional structure into the most mind-blowing creative form. 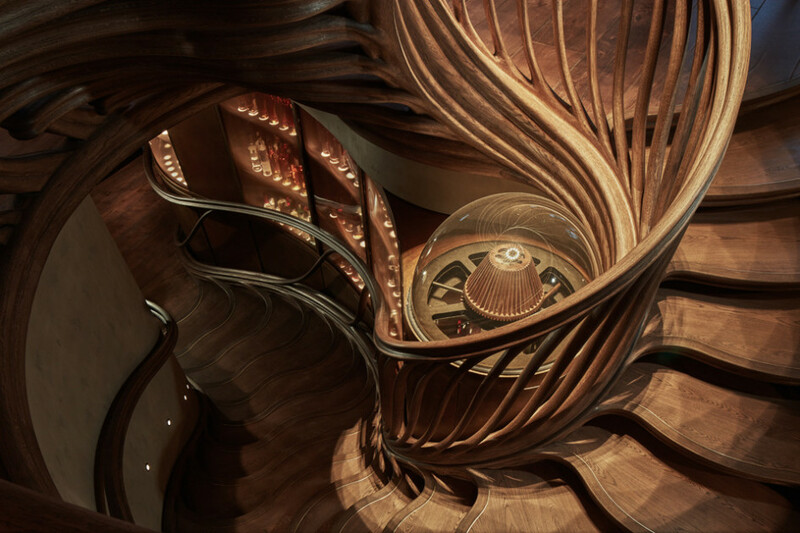 Feast your eyes on some of the most striking staircase designs. 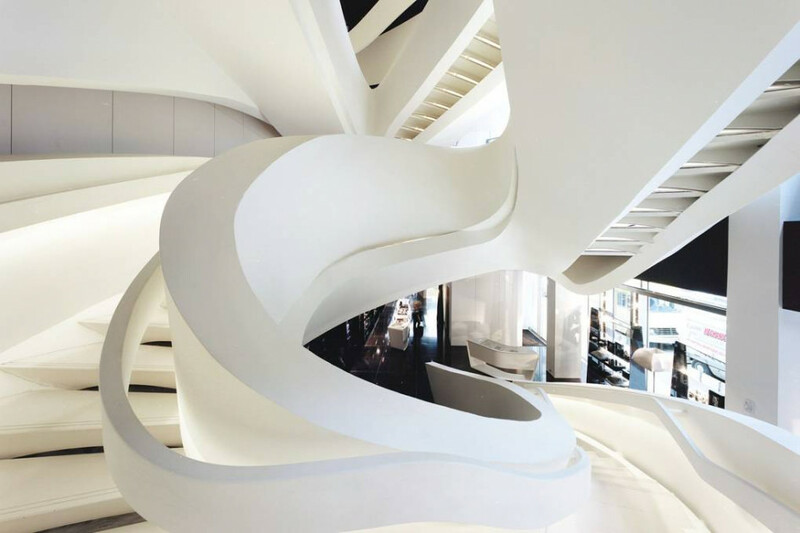 The central feature of the four-storey Armani store on New York’s Fifth Avenue is a sculptural steel staircase, made in Italy, and clad in plastic material that highlights its exceptional presence. It connects all levels and creates an internal dynamism, just like a contemporary luxurious design should be and feel like. The whirlwind created by the staircase is mind blowing and represents a true, bold intention of creating something unique and visually impressive that people would definitely enjoy, no matter in which building it is inserted. Characterised by both style and exclusivity, Mamilla hotel is an intimate and elegant sanctuary with views of the Old City Walls in the heart of Jerusalem, Israel. 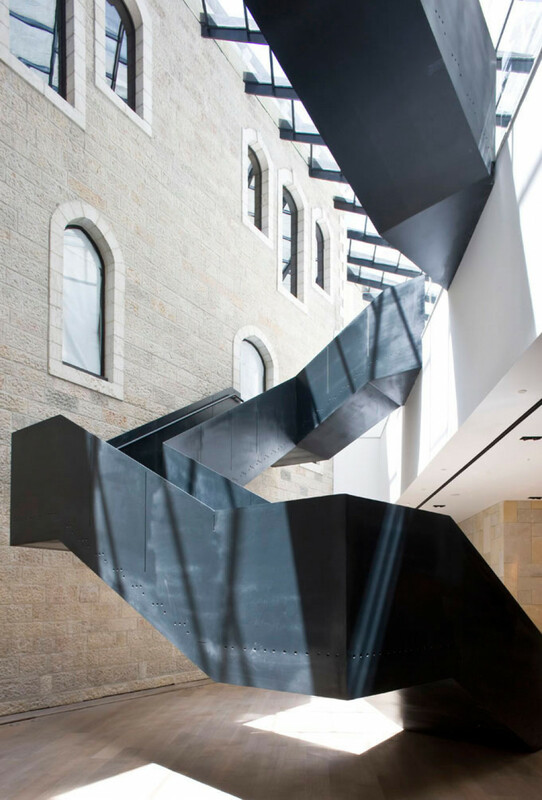 The two parts of the hotel are joined together by a bold, sculptural charcoal-hued steel staircase that ascends through the sky-lit central atria against a backdrop of local limestone wall. 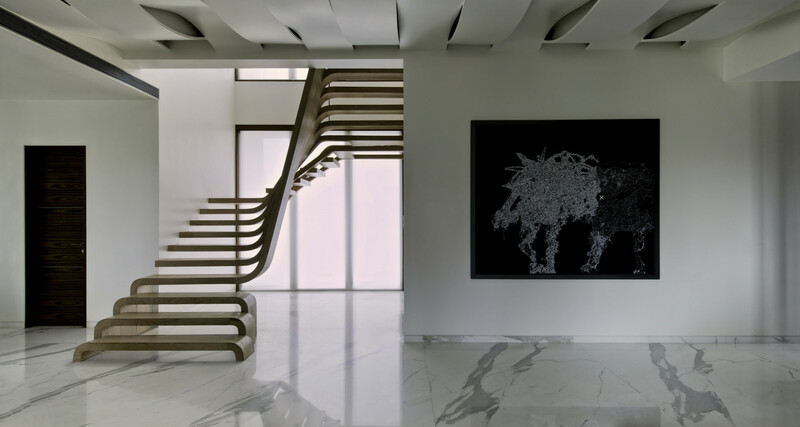 A private residence in Mumbai features an intriguing U-shaped staircase located at the centre of the apartment. Situated in front of a double-height window, the three-sided design features open treads to allow light to permeate the structure and fill the room. Three treads of the engineered walnut staircase remain independent at the bottom, but the upper treads are continuous ribbon-like elements that form steps in two places within the design. 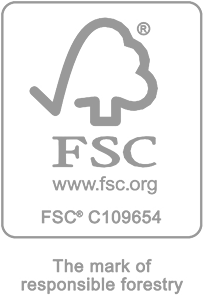 The design of the staircase is replicated in other architectural elements such as the ceiling. 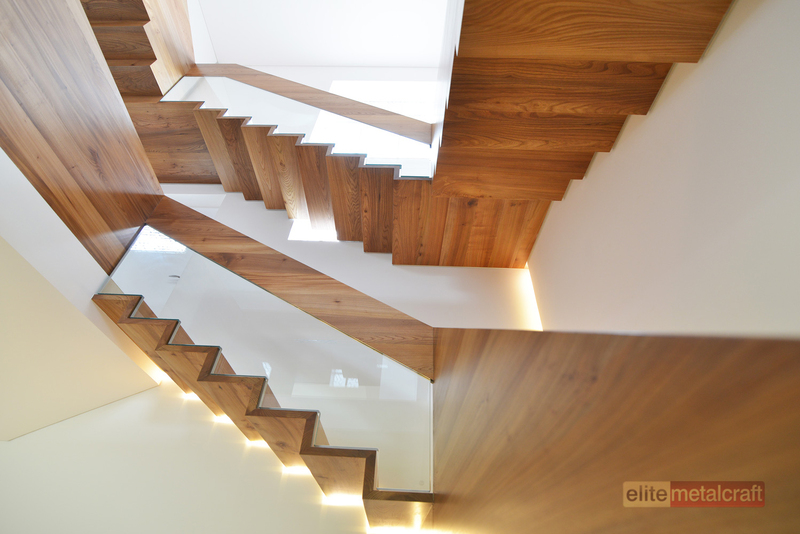 Daleham Gardens Project by Elite Metalcraft Co.
Two floors joined by a floating Elm clad steel staircase offers a unique, high-end contemporary design statement. The triple laminated glass balustrade panels are suspended above the staircase treads and risers using a specially designed hidden clamping system. The overall design is accentuated by integrated lighting, which lends an amazingly elegant appearance. The flowing form of this monumental staircase made from laminated oak provides a centrepiece for Oliver Dabbous’s three-storey restaurant HIDE, in London’s Mayfair. 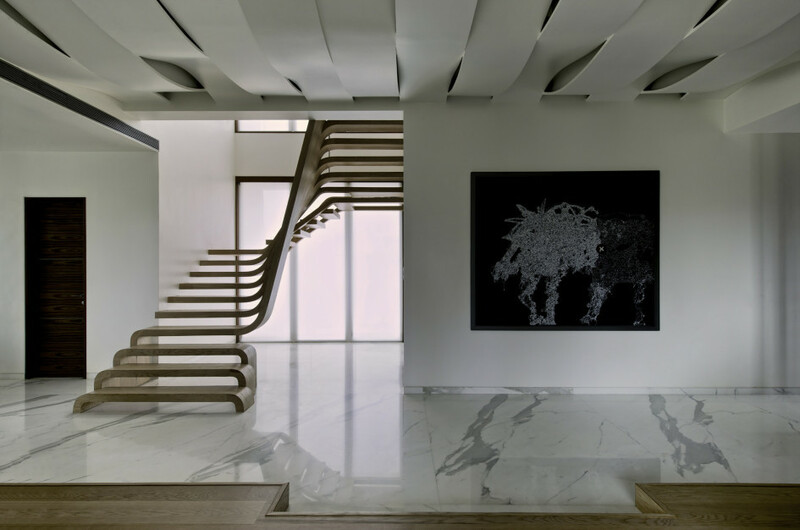 The stairs design creates a plant-like structure that grows like an irrepressible life-force from beneath, ascending from a basement bar to the dining areas on the ground floor and upper mezzanine. Created using a specialised method of bentwood construction, it twists upwards, spiralling energetically like a corkscrew and features tendril-like lines that appear to flow out from niches in the wall. 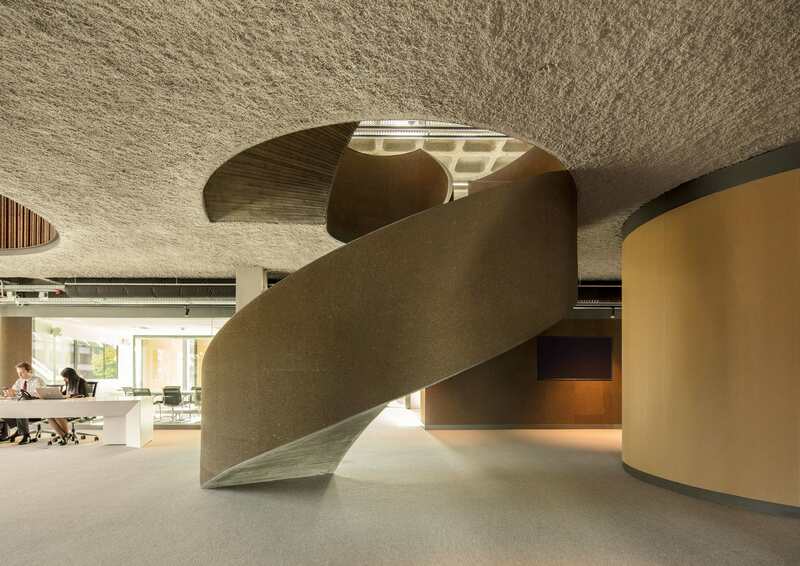 A spiralling concrete staircase flanked by double-height circular voids winds up through the centre of this 1980s office building in Lisbon, thanks to a major facelift by Portuguese studio Promontorio. The undersides of the steps are left ridged, giving the stairs a raw aesthetic. It ascends to the predominantly open-plan workspace on the first floor, and splice through the existing slabs to visually connect the different levels and enable daylight to reach central areas.